The first sneak peak at the debut James Bond videogame from Activision can be seen in the latest issue of GamesMaster magazine in the UK. 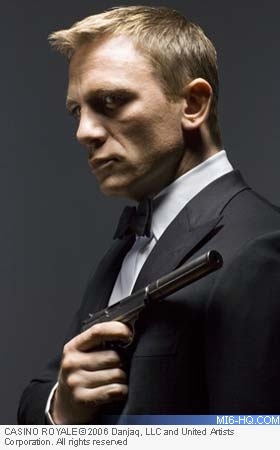 Although not released until Wednesday, details have already leaked out on "Quantum of Solace: The Game". The preview re-confirms the earlier announcement that the game will use scenes from both "Casino Royale" and "Quantum of Solace", as first reported on MI6 last year. The game starts with the opening scenes of Daniel Craig's first 007 adventure - "Casino Royale" - in Madagascar chasing down a terrorist through an Embassy and then a construction site. Similar to EA's "Bond Moments", there are a multitude of action set-pieces which are completed by pressing a fast sequence of buttons as flashed on the screen. This method, as perfected by the popular title "God of War", is first used during the construction site chase to have Bond leap from crane to crane. According the preview though, Sebastian Foucan does not reprise his role with his likeness as the free-style runner packing a bomb in his rucksack. Throughout the game, the system is used to take down enemies quickly or with stealth. The game engine (previously reported to use Activision's "Call of Duty" code) is primarily a first-person-shooter (FPS), but can switch in to third-person-perspective when Bond uses cover or stealth moves. The cover system is said to be akin to that of "GTA IV". Bond will not be able to get behind the wheel of any vehicles in this game. Previous 007 game licencee EA shifted from FPS to third-person in their best-selling game "Everything or Nothing", but this new title from Activision will be the first Bond game to blend the two popular styles. The success of this hybrid will largely rest on the camera AI. Enemy AI is said to feature flank tactics and also communication between them, with their reflexes and skill improving with an increasing difficulty level - rather than simply adding more goons to missions. Like the oft-lauded "GoldenEye 007", stealth will play a key role in some levels where setting off an alarm will make completing a mission incredibly difficult. The game will be roughly split between the two films, but all of the poker action from "Casino Royale" will be consigned to cut-scenes. Set-pieces in and around the hotel will be slightly expanded to give the player more action. Bond's naked torture scene at the hands of Le Chiffre is also said to be on the cutting room floor in order to secure a lower rating for the game. Understandably, the first screen shots from the game are all from the "Casino Royale" levels, so as not to give anything away about the new film "Quantum of Solace". Locations will include: London & outskirts (UK), Venice (Italy), Lake Como (Italy), Siena (Italy), Montenegro, Austria, Miami (USA), Madagascar, and Bolivia.